This bag is perfect for a walk in the park with jeans. 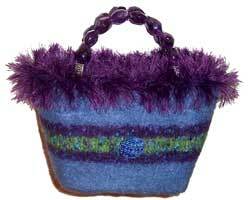 Bright blue beaded stone handles compliment bright blue fur, silver sequins and splashes of pink. Approximate dimensions 7 (h) 9(w) 4 (d ). 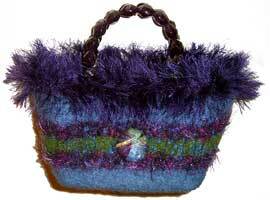 Stunning light blue , green, and purple handcrafted button is the reason for being of this handbag. Add beautiful anythyst handles and the look is stunning. Purple and green stripes topped off with a purple fur- what fun! Approximate dimensions are 7 (h) 9 (w) 4 (d). Beige, but not blah! Lovely beige and brown colors with a little funky eyelash and gold sequins. Beige fur and stone handles. Approximate dimensions 7 (h) 9 (w) 4 (d). 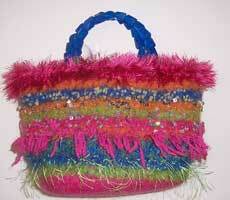 Bright pink, blue,green and orange stripes make this a bag that you think you would find at the end of the rainbow! Silver sequins and funky pink eyelash and fur. Bright blue beaded handles. Approximate dimensions 7(h) 9 (w) 4 (d). Beauty is in the Button!. 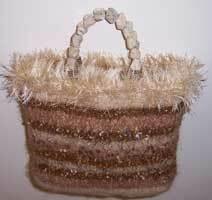 Absolutely beautiful handmade button is the inspiration for this handbag. 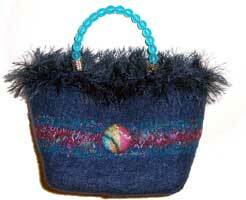 The button colors of navy, teal and maroon are echoed through this bag. Beautiful teal beaded handles and navy fur top it off. Approximate dimensions are 7 (h) 9 (w) 4 (d). One of the most popular handbags. 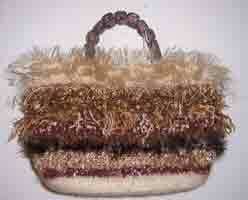 Beige and brown stripes with eyelash and sequins. Beige fur trim and beige rock handles. Approximate dimensions 7(h) 9 (w) 4 (d). 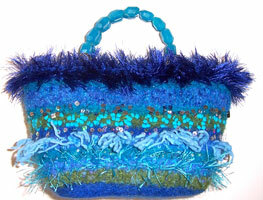 Beautiful blues greens and turquoise yarns make this bag a show stopper. 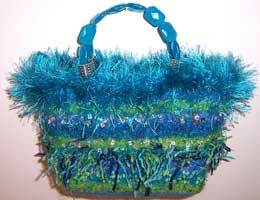 Lovely turquoise agatre handles and bright blue fur and silver sequins accent this fun bag. Approximate dimensions 7(h) 9 (w) 4 (d). Blue , Turquoise and green. 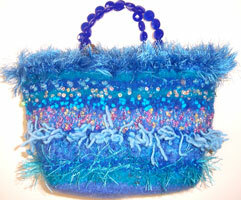 This bag makes you want to go visit the seashore! Bright turquoise fur combined with stripes of blue and green! Beautiful blue stone handles and sequins complete the look! Approximate dimensions are 7 (h) 9 (w) 4 (d). Blue and Green and lots of Fun. Beautiful blues and greens on this fun bag! 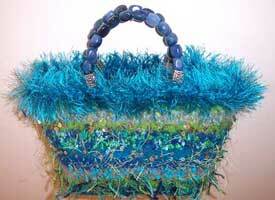 Bright blue fur and matching blue jade faceted bead handles. Sequins and funky eyelash jazz it up. Approximate dimensions are 7 (h) 9 (w) 4 (d).